Ever have trouble keeping track of group projects with classmates, research deadlines or progress with professors? How about staying stocked on milk in your apartment between your roommates? 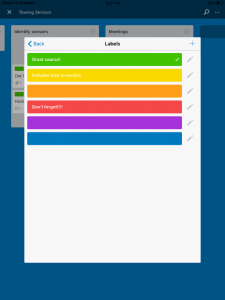 Trello may be the app for you! 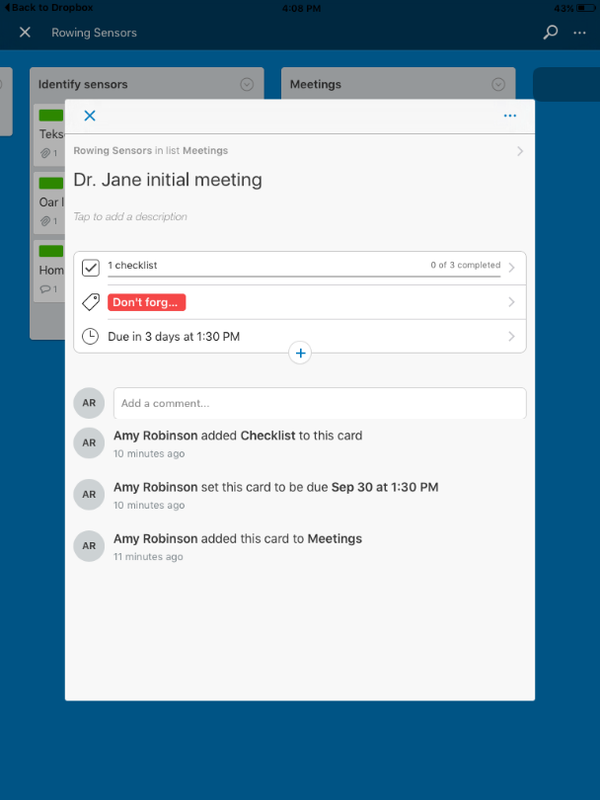 Trello is a free organizational tool that allows you to make and share notecards with collaborators. This app sends notifications to group members of upcoming deadlines and recent changes to the notecards, so you are always aware of group progress. Trello works on iPads, iPhones, and online on both Macs and PCs. Trello helps you visualize what needs to be done on your project by displaying tasks on notecards. Your home page is made of “project notecards”. Clicking on a project notecard opens up a wall of sticky notes you’ve made for different tasks. These sticky notes have many features to help you stay organized and on top of what needs to be done. Notifications for due dates, color coding for notable tasks, file upload features, and check lists all help you keep information consolidate to a single platform. This tool works best when you are researching with a group—you can color code and link useful articles, checklists, and deadlines for your project to easily stay in communication with your teammates. Definitely something to look into for senior design for all you UConn engineers! This entry was posted in Tech Blog and tagged App of the Week, Assistive Technology, Computer, CSDTech, iOS, Linus, Mac, Mobile Devices, Organization, Productivity, Scheduling, Windows.